* Tiny bone shape with lightweight and small size case design are suitable for handling with one hand. * Wristlet design provides extra protection to the instrument especially for user one hand operation. * Low-friction ball vane wheels design provides high accuracy at high and low air velocity. * Build in microprocessor circuit assures excellent performance and accuracy. * Concise and compact buttons arrangement, easy operation. * Memorize the maximum and minimum value with recall. 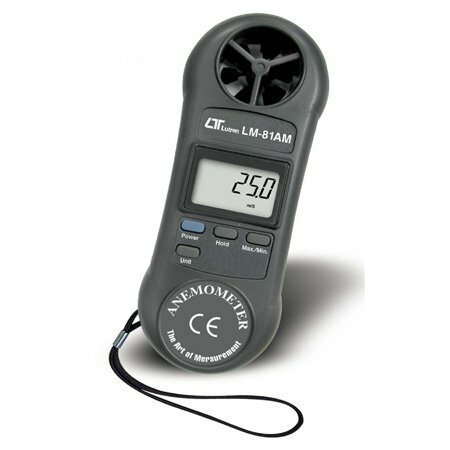 * Air velocity measuring units selectable by pressing button on the front panel for five kinds of units. * Hold function to freeze the current reading value.